St. Patty's Rainbow Push Pops (with Pot of Gold at the End)! Top o' the mornin' to you! Or afternoon, or evening, depending on when you're reading this. 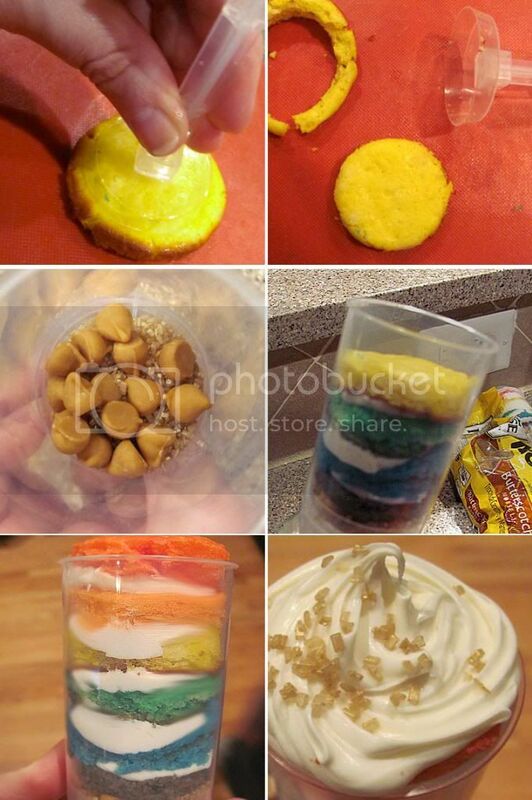 Today, Delaney and I would like to show you how to make these adorable cake push pops--with a golden treasure at the end of that yummy cake rainbow! These are the cutest treat for St. Patrick's Day, and will be enjoyed by young and old alike. I thought it would only be appropriate for my little Irish lass to help me in presenting the instructions to you, on account of her super Irish name and all! Random Camp Makery factoid for you: I met fellow counselor and bestie Andrea in August of 2011. Shortly after, she went on a trip to Ireland and brought back a whole slew of "Delaney" emblazoned treats that we would never in a million years be able to find stateside! After only meeting us once! She's just awesome. Ok, bragging on my girlfriends aside, let's get to it! Start by preparing the cake mix according to the instructions on the back of the package. White cake mix will have instructions for whole eggs and for egg whites only. The reasoning behind this is that the yolks will naturally tint the cake a slightly yellow color. If you want your colors to be as true and vibrant as possible, you can go ahead and follow the whites-only recipe. I followed the instructions for the "whole egg" version, and I really didn't have a problem with the results. Honestly? 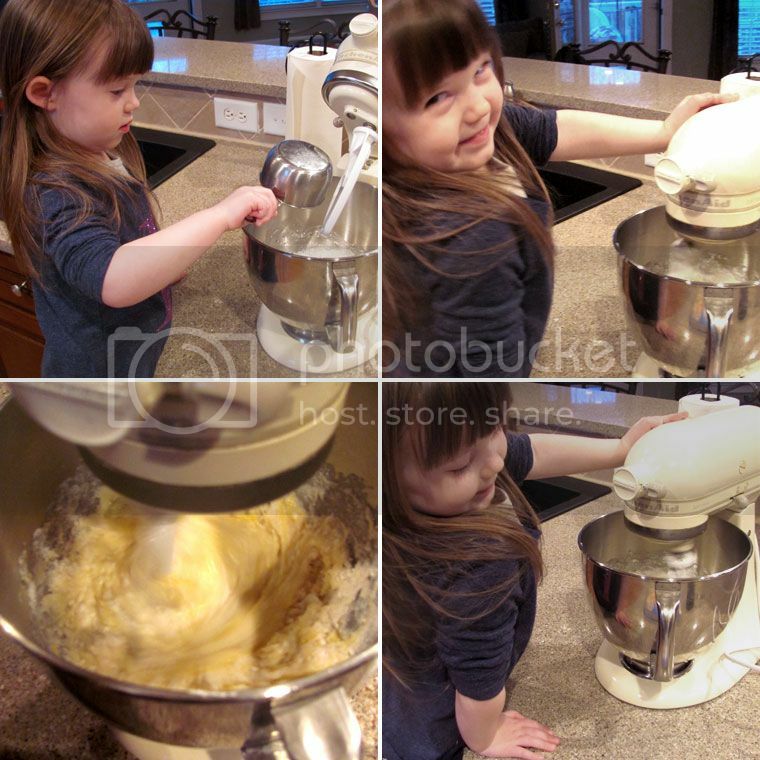 I was being lazy and didn't feel like separating the yolks, especially with an... enthusiastic toddler as a baking assistant. Ahem. This is when things get interesting. 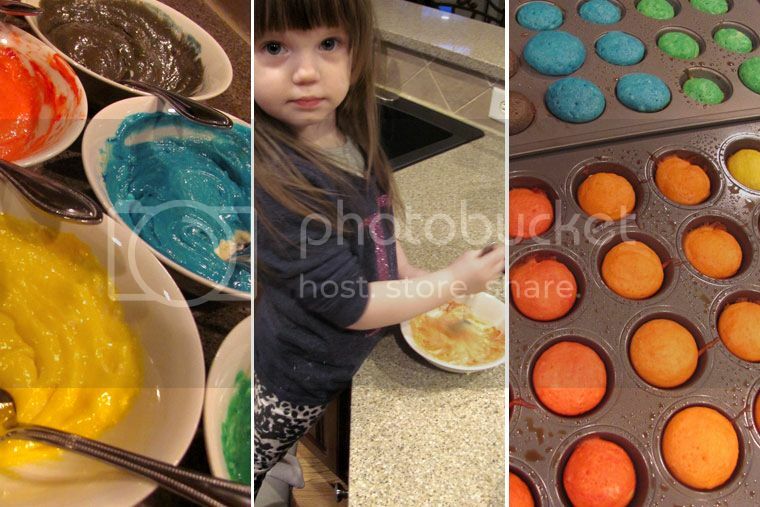 Divide your batter between six small bowls and put a couple of small drops of food coloring in each bowl. You will need red, orange, yellow, green, blue, and purple. For orange, do one drop of red and one drop of yellow. For purple, use one drop each of red and blue. This is like MAGIC for toddlers, btw. Mix until the colors are well incorporated. 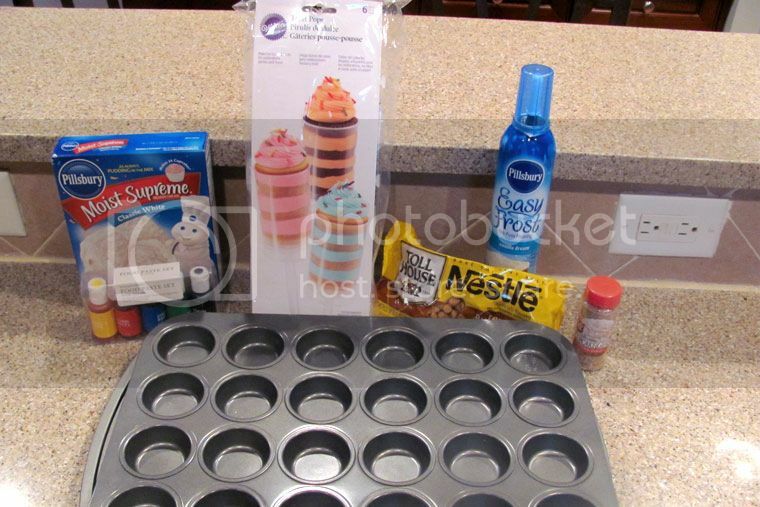 Spray your mini cupcake pans with nonstick spray and drop a small dollop of batter in each cup. I was able to fill eight cups with each of my colors. Bake your mini cupcakes for about ten minutes, but keep a close eye on them and check after about six. Those little guys bake up fast! Once your mini cupcakes are baked through, let them cool all the way. This won't take long because they're so bitty. This next part is a bit tedious, but worth it for ease of assembly and fun for little kiddos. Take each cupcake and smoosh it down so it's about 1/2" thick. Next, remove the "plunger" part of one of your pop containers and use it like a cookie cutter to punch uniform disks out of each cupcake. You will be left with a rainbow of little cake disks. To assemble each pop, start with a layer of about a dozen butterscotch chips mixed with some gold sanding sugar. This is the "gold" at the end of your rainbow! Follow that with a purple cake disk, and squeeze a dollop of frosting (about the size of a nickel) on the middle. Sandwich a blue disk on top, and continue with the rest of the colors. Alternate icing and cake, icing and cake, all the way up. The order should be: purple, blue, green, yellow, orange, red. I will take this opportunity to say that, normally, I make my own icing from scratch. There is nothing that beats a homemade French buttercream frosting. However, the Pillsbury Easy Frost cans are absolutely perfect for this project. The nozzle is nice and long, so you can get close to the bottom of the container. Also, it's easily held with one hand (like a can of whipped cream) leaving your other hand free to hold the pop. With a piping bag, well, that just ain't happening. Finish your pop off with one last swirl of frosting and a sprinkle of gold sanding sugar. Oh, and the Wilton containers come with super handy little caps to pop on top, so they travel way better than cupcakes or the usual form of cake pops. Does your family have any special St. Patrick's Day traditions, or are you in the market for a brand new one? If so, try this one out and show us how they turned out by sharing with us on Instagram!